All Jive systems come installed with multiple music files that can be used as hold music. For those that require their own music, audio files can be uploaded to the system and used in playlists. By creating multiple playlists, your system can be set up to play different music depending on how a dial plan routes a call, or assign specific music to phone numbers, lines (including ringback), call queues, and ring groups. It is your responsibility to ensure compliance with Federal and State Digital Rights Management Laws when uploading copyrighted files. Please see www.copyright.gov for more information. To access the settings for hold music, click Hold Music in the left sidebar. Click to listen to hold music files. Click to download uploaded hold music files. Click to view where the playlist or hold music files are being used. Music files can be dragged and dropped to add them to specific playlists. Click to view all the music files included with the system. Click to view all the music files that have been uploaded to the system. File sizes should not exceed 150 MB. Lists the default playlist (this cannot be edited) as well as all custom playlists created by system admins. Click on a custom playlist to view/edit its associated music files. Music files can be dragged and dropped within a playlist to change the track order. Was this help page useful? Yes, I found the information I was looking for. Somewhat, I found some of the information I was looking for. No, I did not find the information I was looking for. This form is to provide feedback on our help pages. if you need assistance, let's talk—we'd love to hear from you. Thanks for your comments. 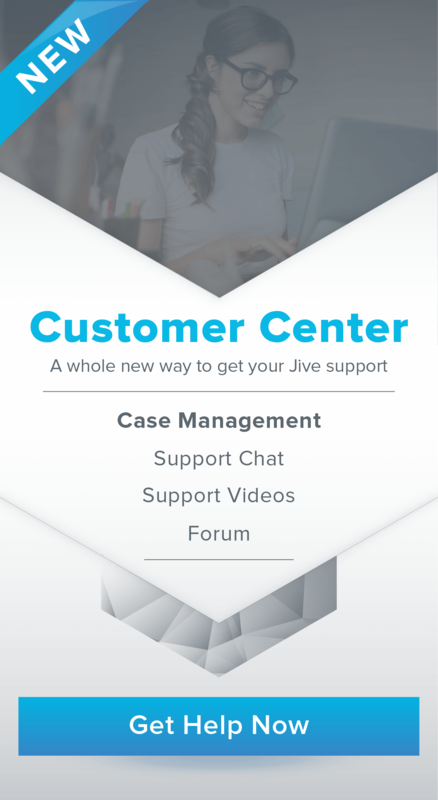 At Jive, we value all customer feedback.